Around the Indian Ocean, the death toll has climbed pass 80,000 and many are still missing. Reportedly among the missing ones there might be a hundred of Americans, 250 Hong Kongers and 3000 Europeans. Millions are homeless. [update 12/30] It's worse... death toll has climbed pass 118,000. About 4000 Europeans and 2000 - 3000 Americans are still missing. - Michelle returned to Malaysia on Dec. 23rd to celebrate Christmas with her family. 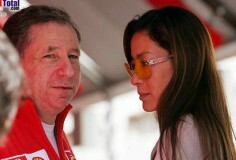 Newspapers reported that she brought Mr. Jean Todt to Ipoh to meet with her parents. On the 26th, they attended the opening ceremony of the Tao Tak Koong temple. Michelle told reporters that she is very happy with the relationship but they have not discussed engagement or marriage plans yet. "What is important is the desire of wanting to be together, sharing good times and bad times," said Michelle, "It's not a piece of paper that says you two will be living happily ever after. It may come, I hope in time, but there is no rush." Michelle said the first segment of Memoirs of a Geisha in Los Angeles had just completed: "I will return soon to continue shooting as the film is scheduled for completion by January." Michelle will be leaving Malaysia for Hong Kong on Wednesday Dec. 29th before returning to Los Angeles on Jan. 2nd to resume filming. Apart from Memoirs, Michelle is currently under the negotiations for two Hollywood and one Hong Kong productions. - Memoirs of a Geisha: some information on next month's Old Sacramento filming. - Memoirs of a Geisha: regular shooting on the Thousand Oaks set has wrapped. - Some photos from the DTC unveiling ceremony can be seen at DTC Official Site (thanks Dean). The event was previously reported at our News of Sept. 27th. Photo at right: Michelle at the ceremony (click to enlarge). - The San Francisco open casting call is looking for more Asian men as extras for Memoirs of a Geisha. - Bluenose Kitty's new report on the sumo shooting for Memoirs of a Geisha is at Dark Horizons. - More information on Memoirs of a Geisha. - Memoirs of a Geisha shooting update: the sumo scene is being shot. - Looks like they have already found enough Caucasians for the extras in Memoirs of a Geisha. The San Francisco open call is now for Asians (men, women and children) only. - CTHD Prequel: Ang Lee does not have a plan when or if to make it. - Memoirs of a Geisha: some on set photos (no Michelle yet). Also some real geisha photos taken by Johnny.K (thanks!) when he visited Gion last month. - Michelle attended the Second Annual Timeless Style Awards ceremony which was held in Hollywood on Nov. 10th. Sponsored by the Premiere magazine and Hamilton watches, the awards honored nine costume designers for their contributions to American fashion. Michelle was invited as an award presenter. Photos: 1. 2. Michelle at the event; 4. 8. Michelle presents an award; 3. Michelle hugs with award winner Colleen Atwood, who is the costume designer for Memoirs of a Geisha; 5. with Mathias Breschan, the president of Hamilton Worldwide; 6. with Mathias Breschan and Paul Turcotte, VP and publisher of Premiere Magazine; 7. with Phillip Bloch (left) and Mathias Breschan. - Memoirs of a Geisha is having another open casting call in L.A., calling more Asian men for the upcoming big Sumo scene. - [Note] I will be out of town for the Thanksgiving holiday. So there will be no update until next week. Happy Turkey day ;-). - In Memoirs of a Geisha: Bluenose Kitty compares the Gion set with those modern Gion photos. - Memoirs of a Geisha update: the Bay Area shooting will take place next January. We don't know whether Michelle will be there as we don't know what scenes will be filmed there at the moment. - Memoirs of a Geisha updates: some photos from real Gion, Kyoto. Links about geisha (thanks Chris for some of the links). And words from Bluenose Kitty. 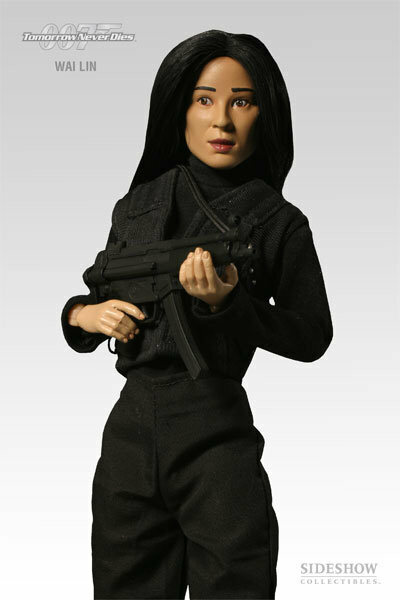 - Pictures of the finalised Wai Lin limited edition 12" figure from Sideshow Collectibles have been unveiled. Compare to the picture from the first version, it is certainly a big improvement. The figure will go on sale in February 2005 and will retail for $40.00. 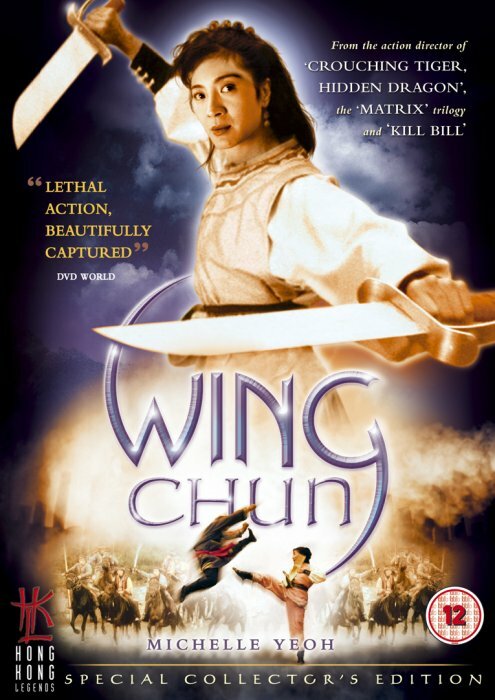 - New in Video Download: Michelle Yeoh interview from the Fox Magnificent Warriors DVD. Michelle talks about making of Magnificent Warriors, her experience with Owl vs Dumbo, and HK production vs U.S. production. 7 minutes. In English. Thanks BAM for encoding the clip! - OK, it's almost a year old... here in Event Photos you will find a new page hosting a collection of photos from the 2003 MTV & SMG Style Awards. Thanks Johnny K. for many of the photos! Some were taken by his reporter friend. And more - you may watch or download a clip of Michelle accepting the award (from Carina Lau) at the ceremony (RealMedia.1 minute. 3.8MB). Thanks to Frida! - Memoirs of a Geisha: shooting of the Sumo scene is rescheduled again. More completed cast list. - Another set report by Bluenose Kitty (thanks!) on Memoirs of a Geisha. Also a link to the Yamashiro Restaurant (with photos) is added in yesterday's Memoirs report. - More information for Memoirs of a Geisha. - For this year's MTV & SMG Style Awards, Michelle, together with Jackie Chan, Donnie Yen, Zhang Ziyi, and Jet Li are nominated as Action Star of The Year. You may vote for Michelle at Style Awards China 2004 (the site is in Chinese. Go to the last name of the 6th item). The ceremony will be held on Nov. 21 in Shanghai. Last year Michelle was awarded as International Actor of The Year at the awards. - Memoirs of a Geisha: additional casting details. - Memoirs of a Geisha: shooting of the Sumo scene is rescheduled. - An exclusive report from the Memoirs of a Geisha set - many thanks to Bluenose Kitty!! - Jackie Chan was promoting the Singapore stock market listing of Media Asia, a Hong Kong-based film company, on Wednesday in Singapore. When asked if he would make more Hong Kong films with Media Asia, Chan said yes as long as the script is good. He said he admires Maggie Cheung and Michelle Yeoh and hopes to have more opportunities to work with them in the future. - Memoirs of a Geisha updates: cast, shooting, and the rumored press conference. - Many of us are not unfamiliar with the name Johnny.K, a Michelle fan from Shanghai, who runs his own websites and has provided many wonderful pictures to this site (e.g., many magazine scans and the recent 1992 JSG photos). Graduated from Shanghai Drama Academy, Johnny is currently starring in a Chinese TV series based on Jin Yong (aka Louis Cha, my favorite martial arts novelist)'s masterpiece "Shen Diao Xia Lu" (Legend of the Condor Lovers). He is shooting at Jiu Zhai Gou and he told me an interesting story: his stunt double, named Xiao Hai, worked on Silver Hawk last year - as a stunt double of Michelle's! :-) Here are some photos of Johnny in costume, as the character Yin Zhi Ping, a Taoist priest. - Added a title pic for Memoirs of a Geisha. Note that it's not based on the film design except for the blooming cherry tree. - More updates on Memoirs of a Geisha. - A Memoirs of a Geisha press conference will be held early next month. - Memoirs of a Geisha updates: crew list, press release of Columbia Pictures, and a link to a Guardian article. - Photos from a set of Memoirs of a Geisha and some shooting information. - Memoirs of a Geisha updates: open casting call (October 23, L.A.), shooting locations, and a possible boycott by a Japanese studio. - A chance to get Michelle's autograph! MYC is having an image design contest. Winners will be awarded with Michelle autographed pictures from The Touch. Details are at MYC BBS Board (under the topic "MYC"). - Memoirs of a Geisha: speaking English with Japanese accent?? - Memoirs of a Geisha was filming at the Belasco Theater in downtown L.A.. See Memoirs of a Geisha News for more details. - Executioners: newly scanned images and a new title picture. - Today more newspapers reported that Michelle said she had no knowledge of the alleged engagement, by quoting yesterday's "Oriental Daily" (Hong Kong), who talked to Michelle on the phone before she left Hong Kong. From the original report, Michelle was smiling and laughing during the conversation. I can't tell if she was serious or joking. Either way, this site does not intend to dig into Michelle's personal life. Michelle said she would "inform everyone if I get married in the future." Michelle is excited and all ready to go into the production of Memoirs of a Geisha. She said even the preparation was very challenging. 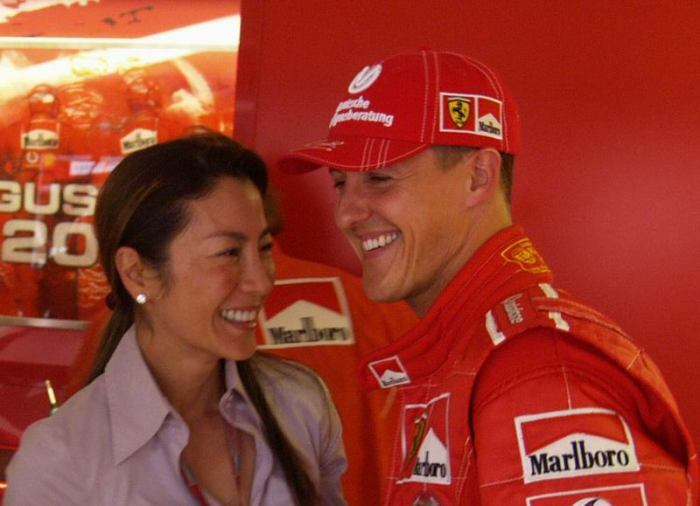 - Today many newspapers reported that Michelle got engaged to Mr. Jean Todt, the Ferrari director. The original report is from AFP, who quoted SCMP ("South China Morning Post") as the source. Hong Kong "Ming Pao" contacted Michelle's assistant and got a "no comment" answer. They also tried to contact Michelle's mother and she said Michelle had not mentioned it to her. True or not, you have our best blessing, Michelle! 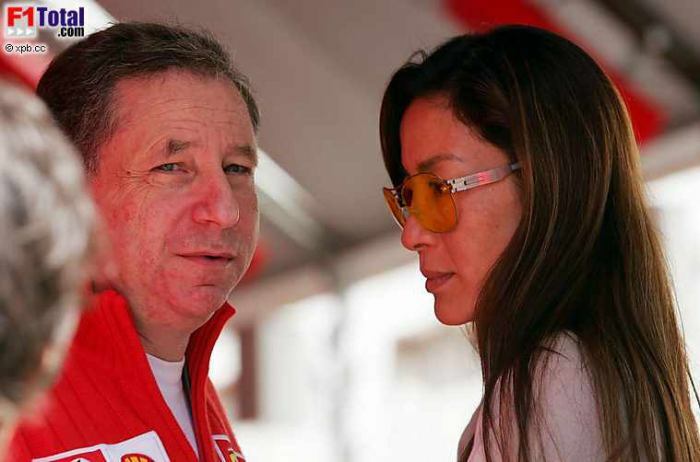 Photo at right: Michelle and Jean Todt at the DTC jewelry show, Spetember 27 ("Oriental Daily"). - A new section for Memoirs of a Geisha has now been created. As usual, there is a section on production news, also an "About Memoirs of a Geisha" page - hope it makes interesting reading. No title picture yet, sorry. - Michelle returned to Hong Kong for the Mid Autumn Festival (moon cake festival - September 28). On the evening of September 27th, she was invited to open a DTC public event for the new release of a FOREVERMARK series of jewelry. Surrounded by reporters, she did not answer directly their questions on her personal life. "Thank you all for your caring. I am very happy right now," said Michelle. "Oriental Daily" (Hong Kong) reported that Michelle took a four-day vacation from the busy rehearsal of Memoirs of a Geisha. - Michelle attended the first ever Chinese F1 Grand Prix at Shanghai International Circuit, Sunday September 26th (news photos from Sina and CNS). - Some rumors from mainland Chinese media claimed that Gong Li had finished her part in the shooting of Memoirs of a Geisha. But I have not seen any report - from either U.S. or Japanese media - that confirms the filming has ever started. - On the News of Sept 2, 2003, we reported that Michelle, as a patron of the Save China's Tigers Foundation, saw two tiger cubs, Cathay and Hope, off to South Africa from China for their rewilding training. 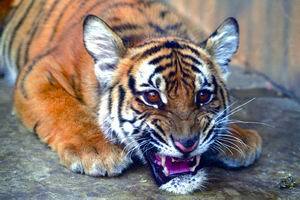 Now three more tiger cubs will be sent to South Africa for the training on October 29. They don't have their names yet. People can enter this (Chinese) website, Give Me a Name, and give the three tiger cubs your favorite names. Celebrities including Michelle, Jiang Wen, and Chen Kaige will be choosing the final names for the tigers from the name poll. Asian (m or f) any ages, you must be VERY fair-skinned (they re-iterated this, like, ten times). Women should arrrive dressed in VERY upscale business wear, well groomed, with your hair down and neat. Your hair MUST be at least shoulder length. If you go, please follow these instructions EXACTLY or they will turn you away. Central Casting, 220 South Flower St, Burbank, California. - I have received some e-mails (from fans in and out L.A. area) asking if I'm going to organize a get-together with Michelle, taking the chance that she will be in L.A. for a while. Sorry I have to disappoint you. I don't have any contact with Michelle or her assistant when they are here. So don't count on me. Try your luck and maybe you will run into Michelle yourself. - Looks like some reporters misunderstood something... no, Michelle will not star in Looking For Mayila. Also the director of the film has not been fixed. - Francis, a Michelle fan in L.A. area, just ran into Michelle this evening on the 3rd St Promenade in Santa Monica. Michelle was getting her ticket to a 7p.m. show on Arizona with her friend/assistant. Francis congratulated her on nabbing the role of Mameha. Michelle said they just started rehearsal on Memoirs of a Geisha. - Producer Thomas Chung announced in Beijing that a romantic film, "Looking For Mayila", based on the story of the famous Chinese western folk song composer Wang Luobin (1913 - 1996), will start production at the end of October. Chinese western folk singer Pan Xiaofeng (a.k.a. Western Daolang) will play Wang Luobin. Female lead goes to Hong Kong actress Maggie Q. Reportedly the cast also includes Michelle, Richie Jen and Cherrie Ying. It will be directed by Mabel Cheung (The Soong Sisters, Beijing Rocks, Autumn's Tale). - It's not really Michelle related. But since a number of people e-mailed me about Zhang Yimou's Hero which is playing in North American theatres, I'd like to share this "The Epoch Times" article with everyone: Whose Story Does the Beautiful "Hero" Tell? - More on HKL Wing Chun DVD (thanks to BAM): unfortunately, looks like we won't see any new Michelle interview. But there might be some interesting anecdotes from the other interviews and Bey Logans commentary. The DVD will be released on September 20th (Region 2). - Silver Hawk was awarded the "Best Co-production Film" at China's Huabiao Awards. Michelle did not attend the award ceremony which was held in Beijing on August 28. Co-producer Thomas Chung received the award. Congratulations!! - Here is a larger version of the HKL Wing Chun DVD cover. Thanks BAM! - Memoirs of a Geisha cast officially announced! Producers and director announced principal casting for the ensemble drama today: Oscar nominee Ken Watanabe (The Last Samurai) has been signed and will be joined by a spectacular ensemble of international actors including Zhang Ziyi (Crouching Tiger, Hidden Dragon), Gong Li (Raise The Red Lantern), Michelle Yeoh (Crouching Tiger, Hidden Dragon), Youki Kudoh (Snow Falling on Cedars) and Koji Yakusho (Shall We Dance) who are in final negotiations to star in the feature film. Michelle will portray Mameha, the elegant and experienced geisha who becomes Sayuri's mentor. Filming will begin next month in Los Angeles and Japan. 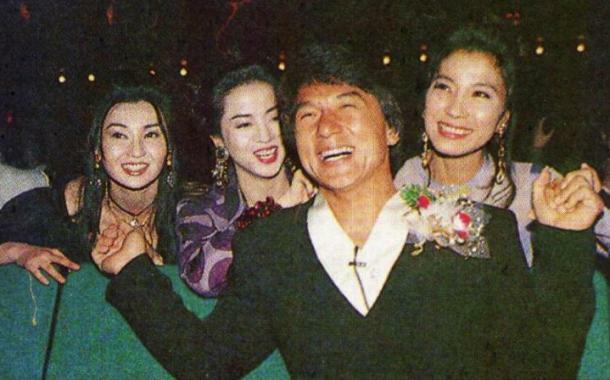 - On today's Empire Online (U.K.), at the end of a report on a John Woo - Chow Yun-Fat future project, it says that Chow Yun-Fat "is next up for Chinese-language actioner Hua Mulan, with Michelle Yeoh." - Play.com listed the special features and technical details of the upcoming HKL Wing Chun DVD (thanks BAM). Wonder if they got a new interview with Michelle. HKL has always done superb job with the DVDs they release, including some surprising extras. - Hong Kong Legends (U.K.) is releasing Wing Chun DVD (region 2) on September 20th (thanks Kevin). Watch the HKL Wing Chun trailer. - Supercop tonight - San Jose. Mercury News (more details see News on June 30th). - Melissa has made some beautiful wallpapers for me. Also one from Rowena. Thanks!! We have fans from at least 29 countries/regions signed on: Australia, Canada, China (Mainland), Egypt, England, France, Germany, Greece, Hong Kong, India, Indonesia, N. Ireland, Italy, Japan, Malaysia, Netherlands, Norway, Philippines, Puerto Rico, Russia, Saudi Arabia, Singapore, Spain, Sweden, Switzerland, Taiwan, Thailand, U.S.A., and Vietnam. Among us, some are as young as 13, and some are as o... uh, also young - as 53 (counting only those who specified their ages in their messages). THANK YOU everyone! I will make sure Michelle get all the messages. We wish her the happiest birthday and - happiness everyday! - It is confirmed that one of the Hollywood film deals Michelle had been negotiating is indeed Memoirs of a Geisha. It is not clear what role (or if ) she has signed on. There have been no report on the cast from major American media. Today's report on IMDB news stating that Chinese actress Gong Li also signed on the film in additional to Michelle and Zhang Ziyi came from a London news source. The rumor has been circulating on Chinese news for days. - Geez, what the hell has been going on with Chinese language media these days - rumors and lies everywhere! Most of them are not Michelle related, but some are. They have caused quite a lot of confusions among those who read Chinese and I have received a number of e-mails regarding some of the "news". Thomas Chung, the managing director of Han Entertainment, accepted interviews by HK's "Oriental Daily" and "Apple Daily" on July 31st. He said that those reports are false. He clarified that Mythical Films still exists, and there is no change for the leading role of Hua Mulan. The recent round of rumors regarding Michelle, Mythical Films, and Hua Mulan was started by a single Taiwanese newspaper ("Sing Bao"). But it was soon copied by over 40 mainland Chinese newspapers (without mentioning the source) and also went on Malaysia and Singapore news. In the past I have witnessed many times how media make "news" deliberately. What I'd like to say now is do not trust everything you read. Use your brain and let time to tell the truth. - Sony Pictures announced another open casting call for Memoirs of a Geisha - this time calling for female dancers 18 and older. August 5 in Los Angeles. - [update] Today's HK news says that Michelle is going to star in Memoirs of a Geisha. Reportedly the production company has sent the costume designer to meet Michelle in Germany, where Michelle currently is. "Oriental Daily" reporters contacted Michelle's assistant, who confirmed that Michelle is in Germany at this moment but declined to comment on whether Michelle will star in the film: "Let's wait for the production company's announcement." - Thought I'd share what I know about the the casting on Memoirs of a Geisha as so many fans are concerned about it especially after hearing the rumors that Michelle and Maggie Cheung have lost out on the lead role to Chinese actress Zhang Ziyi. In a recent public event in China, reporters asked Zhang Ziyi if she is going to star in Memoirs of a Geisha. She said: "I can't tell now. The production company will announce it later." Asked if it's true that she won her role from Maggie Cheung and Michelle, she answered: "No. There are many characters in the movie. I don't know who else will be on the cast. I hope I could have a chance to work with them." It seems like Zhang Ziyi has indeed landed a role in the film but it is not clear to public which role it is. Since this is a Hollywood production full of Asian cast, MANY Asian and Asian American actresses have been invited to audit for various roles in the film. Reportedly there are three main geisha roles in the film. According to someone whose daughter recently went auditing for the young Sayuri (main character of the book) role, all five girls went for the 3rd callback in NY audition looked alike: "Small, delicate face. big eyes. Thin and long body portion." It is said that the production company strongly prefers someone with Japanese accent. - A news (not a rumor) from a reliable source: Michelle had been negotiating deals with TWO Hollywood productions, which are aimed to start this year. I can't confirm if Geisha is one of them at this moment (I personally think it is). We can expect to hear some official news next month. Keep your fingers crossed. - New development about Hua Mulan. - Added in Gallery: scans of a new article from "TrendHealth" (July 2004, China) in the "Magazine" section and a new art work in "Fan Arts". Thanks Johnny and Frenda. - China's "BigStar" reported that one of Michelle's upcoming projects is a documentary, which is tentatively entitled "Price of Love". It will contain a series of stories of famous actresses since 1950s. It hasn't been fixed how many stars and how long each story will be in the show. 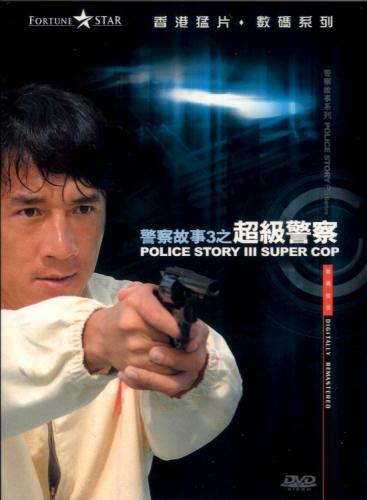 Reportedly Anita Mui and Brigitte Lin are among the selected stars. Michelle will be the host as well as a star in each story. She invited Ann Hui (Ah Kam) to be the director. Ann Hui said the challenge of such a documentary is the balance between art creation and reality. The documentary is planned to be distributed in four versions: TV series (China, at least), film, extended DVD, and book. - New in Links: an article from a Chinese magazine, TRENDSMAG, July issue. Also a recent interview of Michelle with Shanghai Oriental TV (interviewed in June during SIFF and aired on July 11th). In simplified Chinese. With photos. (thanks Lisa!) In the interview Michelle mentioned that she may star in Hollywood production(s) this year. - Michelle had an early birthday celebration, folks :-). She visited our Birthday Greetings page today and read our messages. Furthermore, Michelle posted her own message here to everyone - THANK YOU, MICHELLE! hey my dear friends around the world!!! presently, i am in Italy and warms my heart to see all these wonderful birthday messages. Thank you for your LOVE!! You can view Michelle's original post at the Birthday Greetings page. Don't worry if you haven't signed on yourself yet. All greetings signed by August 2 will be forwarded to Michelle on her birthday (August 6) and she will see them. 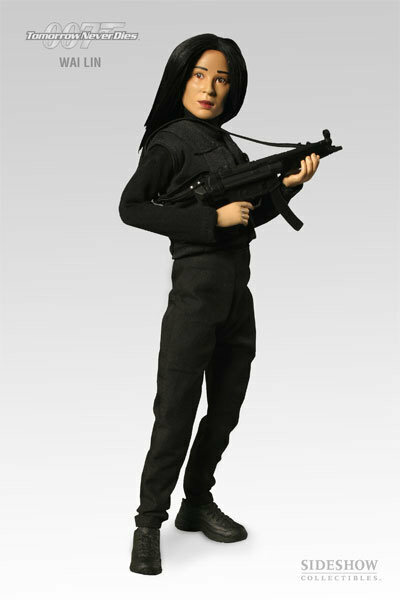 - Wai Lin Figure Announced By Sideshow. Pre-order can be done at Sideshow Collectibles. You can see a photo of the special limited edition Wai Lin figure, sculpted by Andy Bergholtz, at above links. 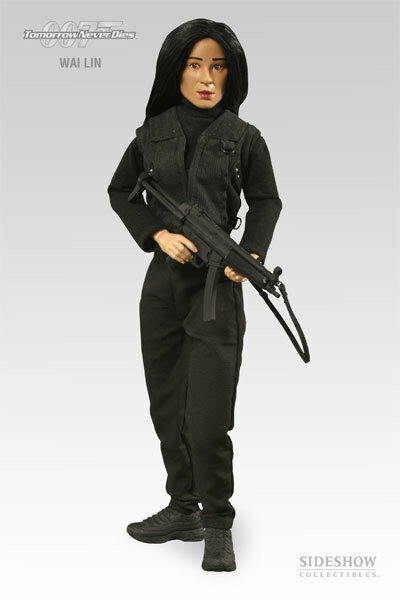 Geez, I surely hoped they could make the figure more look like Michelle than this! 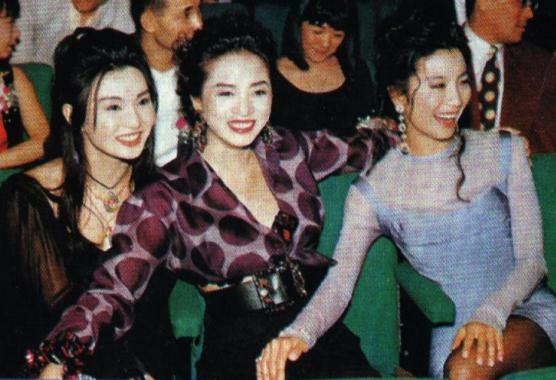 - Memoirs of a Geisha: no, I don't know yet if Michelle or Maggie Cheung would star in the film. But if you are an Asian girl aged 8 to 18, you may have chance to star in the film yourself. The film will begin shooting in September in Los Angeles and Japan. 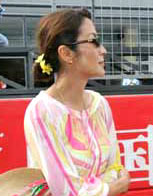 - News from Mainland China and Taiwan reported that Michelle showed up at the F1 racing last weekend in France.